Ronald Coase passed away on September 2. Here is a brief discussion of his most famous contributions, of which “transaction costs” matter most for political scientists. The End of IR Theory? 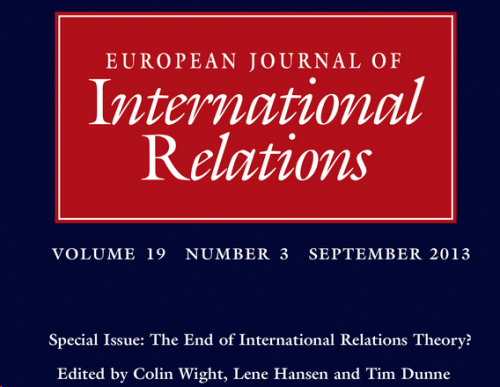 In case you somehow missed it: The Duck of Minerva is running a symposium called “The End of IR Theory?” together with the European Journal of International Relations. It spans “twenty-five planned posts consisting mostly of teasers of articles in the special issues and responses to those articles”. Here is an overview of all blog posts, and you can find the special issue here. The German “Verfassungsschutz” has sent a helicopter to the U.S. consulate in Frankfurt – to find out if the Americans really have spying gear installed on the rooftop, as alleged by Edward Snowden. Security expert Bruce Schneier argues that whistle-blowing is the information-age version of civil disobedience, and that intelligence agencies have to worry because their young employees are less loyal then previous generations. I’m not entirely convinced about the explanatory power of a “generation gap” as opposed to, say, better technology to copy and spread data. In other news, the “twerking fail” video was a fake. So now we should not only have a discussion about Miley Cyrus’s dance moves diverting attention from Syria, but also consider the net effects of media-critical fake videos: Do they help because they make us feel guilty and pay more attention to politics, or are they part of the problem? Stay tuned for the meta-discussion that is about to divert attention from, uhm, what country again? Other, other news: The Daily Show explains what’s good about colonialism and why Persia is such a complicated place.